Hi Kim Remember me? I am the computer illiterate. Anyway I enjoyed seeing my girls together. Speaking of girls…last night Julia called. While she knew that you and Cheryl were with Emily, she was surprised to hear that I was going to South Africa. Dear Kim, I AM HERE. No one met me at the gate. After some anxiety I proceeded to baggage and customs — not easy at all. Anyway I am here. Vantage gathered its crew for the trip to our hotel. Incidentally there are only 17 of us. I am the odd man out. Oh well! This hotel is great AND I brushed my teeth tonight. I love you all but I am exhausted from the planned experience. I was relieved she was fine. She had so much stuff! I thought she’d lose the most important things like passport, tickets, etc. Her reference to being able to brush her teeth had to do with her fear that the water would make her sick. We heard her concerns so often that Cheryl found a special toothbrush that would get the job done without using water. OMG – her survival gadgets! She couldn’t buy enough of them. I am sure the travel catalog companies were loving her for the five months preceding her departure. Dear Kim The weather has been great. The people have been great and having a wonderful experience. The animals and I are on first name basis. I am managing my food needs adequately. Don’t expect to hear from me often as places I am going to don’t all have internet facilities but all is well. Give your siblings regards from me. Lots of love mama. Dear Ones, THIS is a great experience! I like the country, the people with whom I am traveling and the guide who guides us and drives us from morning to night. He seems determined to give us a wide variety of experiences. Here I sit at this ungodly hour trying to write you guys. However I am happily situated in a hotel which hosted the Queen of England when she was a girl. I must say I have been exposed to the most elegant and the most elegantly primitive: The Victoria Falls Hotel in Zimbabwe [and Chobe National Park huts].Today we walked a couple of miles along the falls. Yes I have been taking some pictures. 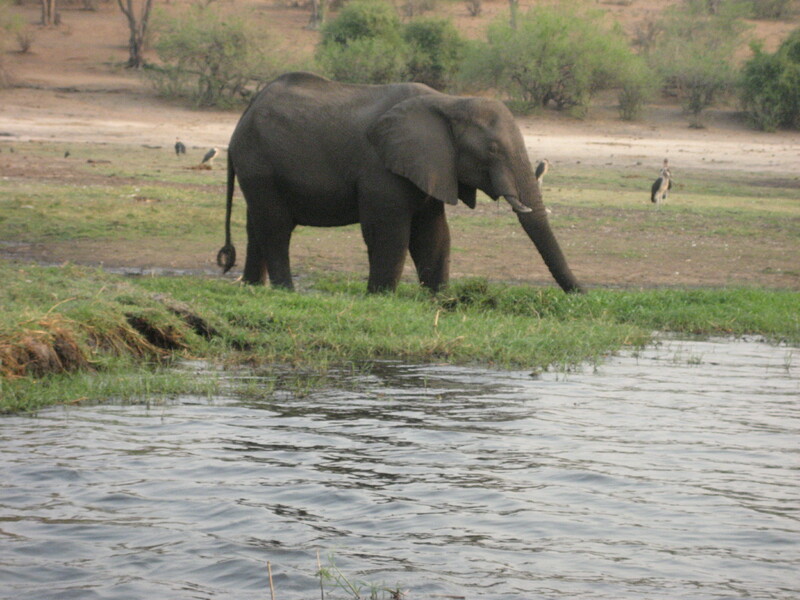 We just arrived Botswana where we had been on two or three safaris — seriously wild and deep in the Bush. Oh yes, on my actual birthday I was tracking beasts in the wild. That night the group sang happy birthday and Brian gave me a book featuring the elephants. The next night as we ate out on the verandah, I was serenaded by the staff of young Africans and presented a cake shared by all. While it was late and I am not much inclined to eat cake, only a few people noticed. Thanks everyone for your messages which I read when I came to my room that night. A special thanks to Emily whose tribute I shared with a few of my new friends. MyLetter has mostly disappeared. Oh well! This entry was posted in TRAVEL and tagged birthday celebration ;, Chobe National Park, elephants, safari, South Africa, travel, Vantage, Victoria Falls. Bookmark the permalink. Thank you, Linda! Yes, my siblings say that I act like Ms. Daisy. I sure hope I can be as gutsy as she when I’m 88!